We call the anniversary of a death yahrzeit which is Yiddish for “a year’s time.” We know that you do not need a yahrzeit to remember the many ways in which your loved one enriched your life and the lives of others. We also know that grief can become more intense as another year comes to an end. Observing this milestone can be both private and intimate, public and communal. Your private observance might include lighting a yahrzeit candle. The flame is a Jewish symbol of the soul. It helps give form to memory as it is visible, warm, and evocative. The candle typically is lit on the evening before the day of the anniversary, since Jewish days begin at sunset. There is no bracha, no fixed blessing, for lighting the candle. Many people recite a private, personal prayer. Tzedakah or righteous giving is another way to make memory tangible in this world. Supporting organizations and causes that were important to your loved one keeps their beliefs alive and active. May the memory of your beloved bring you comfort and be an enduring blessing at the time of this anniversary and always. There is an opportunity to make a memorial contribution to one of the funds listed. You may make your donations online: www.temple-beth-el.org. To add a loved one to be read during a minyan or service, call or email Jenn Thomas (401-331-6070, JThomas@temple-beth-el.org. 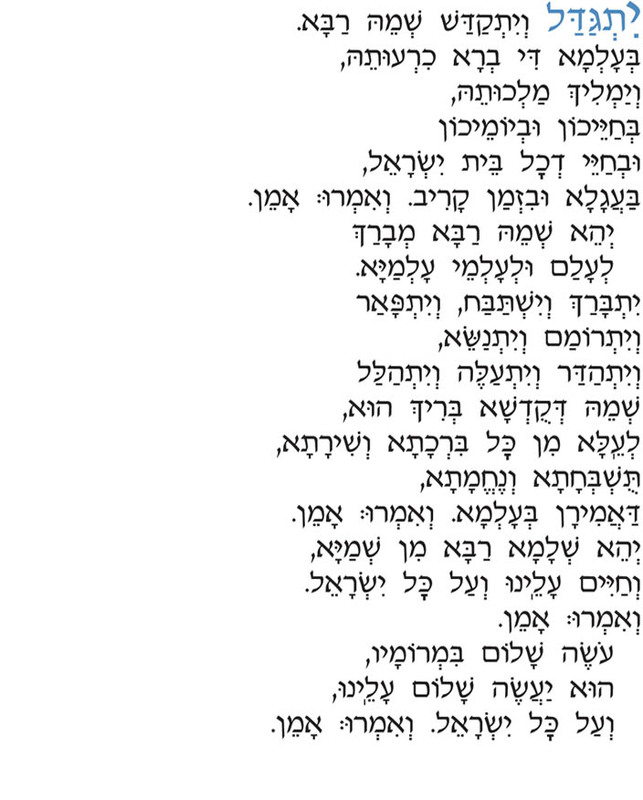 The ancient words of the Mourner’s Kaddish, while reminding us of our loved ones, offers the hope of a world where the Divine Presence is made known and peace fills our land and our lives. Exalted and hallowed be God’s great name in the world which God created, according to plan. May God’s majesty be revealed in the days of our lifetime and the life of all Israel — speedily, imminently, to which we say Amen. Blessed be God’s great name to all eternity. Blessed, praised, honored, exalted, extolled, glorified, adored, and lauded be the name of the Holy Blessed One, beyond all earthly words and songs of blessing, praise, and comfort. To which we say Amen. May there be abundant peace from heaven, and life, for us and all Israel. to which we say Amen. May the One who creates harmony on high, bring peace us and to all Israel. To which we say Amen.